Description: A red solitary ascidian with usually some detritus adhering to the test, giving it a dirty appearance. The siphons are slightly square in cross section and flared out at the end when fully expanded. The atrial siphon is placed laterally, about one third of the way down the body. Both siphons are often paler than the body, almost white in some specimens. 20mm tall x 15mm broad. 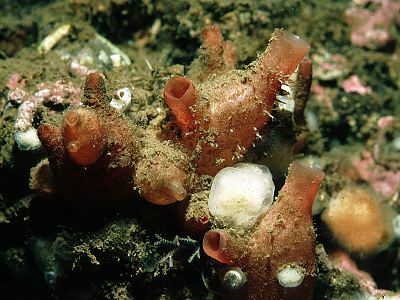 Habitat: A common ascidian in areas of strong water movement, also occurring in sheltered places. Similar Species: This species can resemble Dendrodoa grossularia closely, and considerable experience is needed to separate these species reliably in the field. Pyura microcosmus can generally be distinguished by its striped siphons. Dirty test with adhering silt. Siphons square on partial contraction. Picton, B.E. & Morrow, C.C. (2016). Polycarpa scuba Monniot, 1970. [In] Encyclopedia of Marine Life of Britain and Ireland.